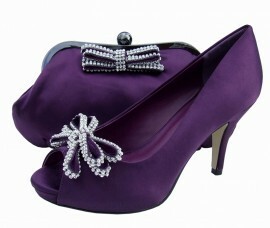 Elegant plum purple evening shoes and matching bag by Spanish designer Menbur's sister brand Avance. Peep toe ladies shoes with a pretty diamante encrusted bow and platform sole. 8.5cm satin covered heel and a 1.5cm platform sole. The matching soft clutch bag with a pewter frame and a pretty diamante encrusted bow. The evening bag is 24cm x 12cm tall.